The game’s storyline is around breaking into a lab to steal an antidote for your uncle’s ailing wife Isabel. It definitely has all the elements of this storyline in the game with most of the game spent recovering parts of the antidote with a digitally preserved version of Isabel providing you with hints. There isn’t any extra development of the story during the game. One of the things we loved about Wrong Turn was the use of different spaces. 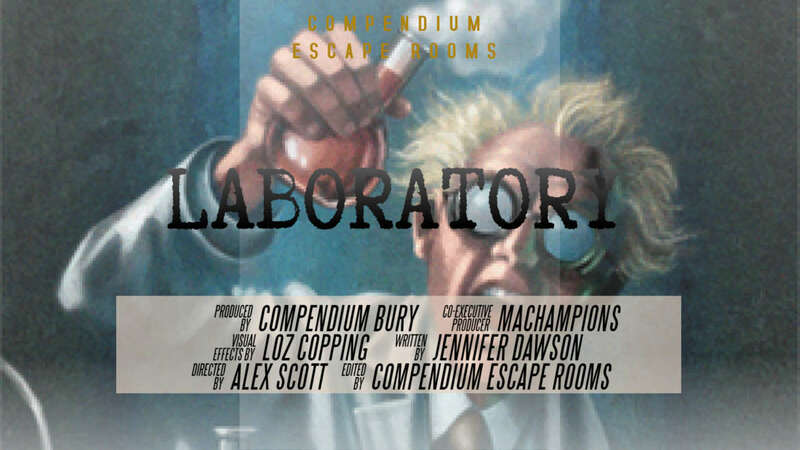 Compendium have done that again with Laboratory. There are a number of spaces you work through with each having a distinctly different feel and set of puzzles. We really liked this as it always felt like you were exploring and discovering more. The main Laboratory space is really well put together and definitely looks the part. They’ve used some exciting physical puzzles to mimic some of the interactions you’d expect to have in a real world laboratory, but they’ve done it in a really fun way. I can see this game being very popular with families. Throughout the game, we found most of the puzzles to be extremely logical and achievable. There was only one puzzle we felt that was a little bit ambiguous and caused us to get a 5 minute lockout on a safe that left us unable to do anything else. We talked about this with the owner at the end of the game and I believe it’s something they are looking at changing. After all this is a game that has been only open a few weeks. The guys at Compendium are really passionate about what they do and always keen to hear feedback and improve their games. We also had a mishap where I unwittingly forced opened a maglock that revealed a part of the game early. I thought I’d completed an action to unlock it, but it turned out not to be the case. This also had the knock on effect of stopping the end sequence of the game working which left us a little bit confused for a minute or so. Our host couldn’t apologise enough, but to be honest, it was partially my fault and just one of those things. It didn’t spoil our overall game experience. 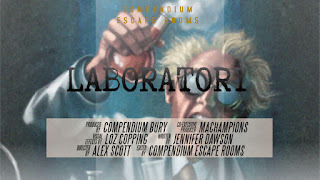 Overall we thought Laboratory was a good game with lots of fun puzzles and plenty of variety to keep us entertained. We enjoyed exploring the various spaces and appreciated the theming and decoration throughout. I think this game is one of those that both enthusiasts and beginners will find something to enjoy. I can certainly see families and children really enjoying the interactive elements of this game. We’re looking forward to see what Compendium do in the future. The team were Daniel, Beth and Becky. 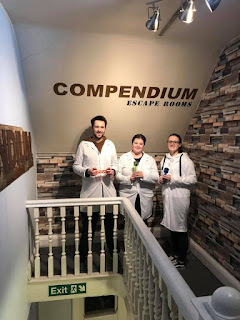 Overall Compendium have done it again – another great room with excellently flowing puzzles that’s really fun to play. Difficulty There are quite a number of puzzles to get through, but nothing is overly challenging. I can see most teams escaping. Fun We had lots of fun. There are lots of different spaces in the room and plenty of interesting puzzles. Puzzles There were a few nice physical puzzles in this room that worked well in the Laboratory setting – these were really fun to interact with. The puzzles were extremely logical. Immersion It’s a nicely themed space with lots of things you’d expect from a Lab – however, they have mixed it up a little bit so it’s not all clinical white. It has a storyline, but it doesn’t develop much within the game. Surprises There are a few exciting discoveries within the game and an initial wow factor when you see the lab.